Register today for the iPad Media Camp workshop Aug. 3-5 in Bluemont Hall. Registration is open for a three-day, hands-on workshop designed to inspire and equip educators to facilitate student media projects using iPads. The iPad Media Camp is being held Aug. 3-5 from 8:30 a.m. to 5:30 p.m. in Bluemont Hall. The sessions are being co-lead by eBooks author Wesley Fryer and Cyndi Danner-Kuhn, instructor of curriculum and instruction. Kuhn said the workshop will focus on creating narrated slideshows and screencasts, creating and safely sharing “Quick Edit” videos, and the final day will focus on interactive writing and creating multimedia eBooks. For more information and registration information, visit www.ipadmediacamp.com. It was a busy day for those attending iCamp. 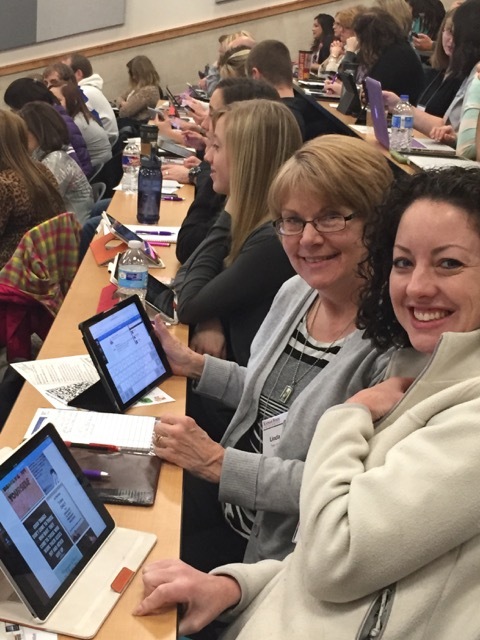 Nearly 200 K-20 educators attended the second annual iCamp in Bluemont Hall, looking to expand the use of iPads in their classrooms. Cyndi Danner-Kuhn, instructor of curriculum and instruction, developed the innovative and engaging workshop. The experience took educators through an immersive experience to deepen their understanding of how students create, connect, share and collaborate with iPads. Wesley Fryer was this year’s featured guest. He is an author, STEM elementary teacher, digital learning consultant, digital storyteller, and change agent.